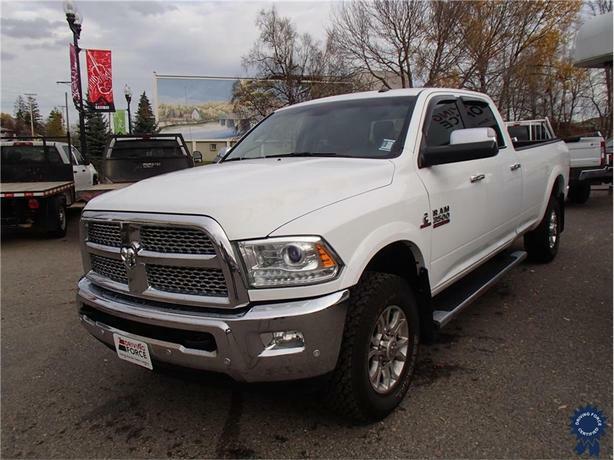 This 2017 Ram 3500 Crew Cab 5 Passenger 4X4 8-Foot Long Box Truck comes with a 169-inch wheelbase, 6-speed automatic transmission, 3.42 rear axle ratio, 18-inch wheels, leather bucket seats, 220-amp alternator, transfer case skid plate, power sunroof, rear window defroster, bright tubular side steps, Uconnect 8.4-inch SXM/Hands-Free system, remote start system, keyless enter and go with push-start, power-adjustable pedals with memory, electronic transfer case, electronically controlled throttle, Class V towing with harness, hitch, brake controller, and trailer sway control, tire pressure monitoring system, power folding mirrors, heated steering wheel, HD shocks, 121.1-litre fuel tank, 4,290 lbs Maximum Payload, and GVWR rating of 12,300 lbs (5,579 kgs). The 6.7-litre Cummins I-6 Turbodiesel engine provides 370 horsepower at 2,800 RPM and 800 lb-ft of torque at 1,600 RPM. Touch base with us to discuss purchasing or financing options that are right for you and experience the difference you will only find at DRIVING FORCE Vehicle Rentals, Sales and Leasing.